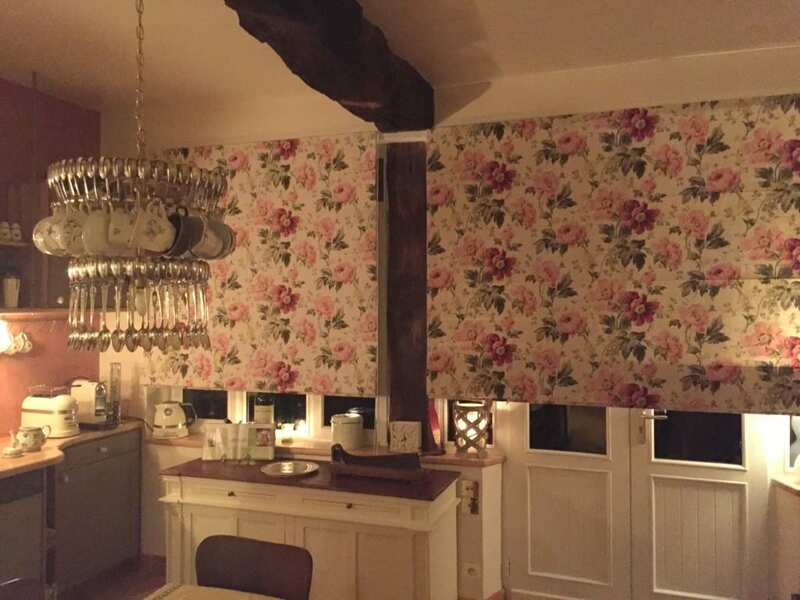 Some of our customers have been very creative in the way they’ve repurposed antique furniture they bought from us. When you buy a piece of antique furniture, that piece was lovingly hand-crafted for a specific use. 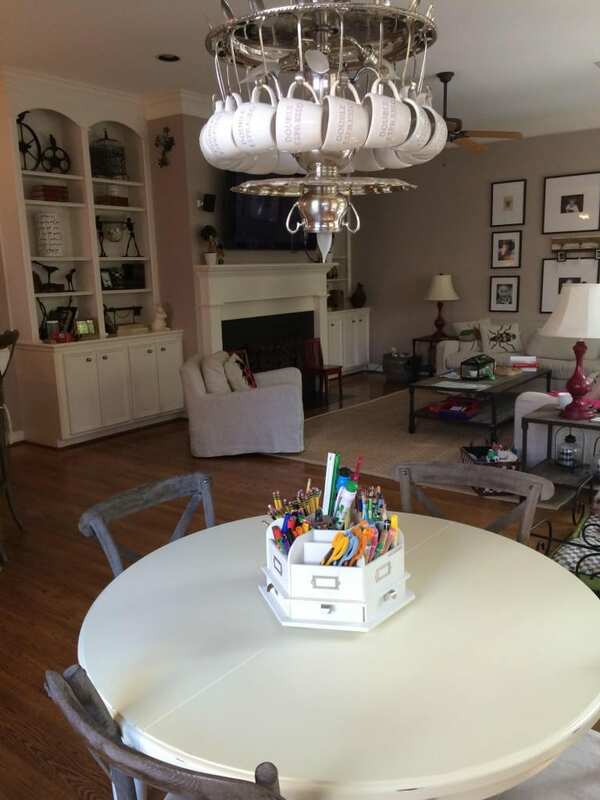 Perhaps it was made as an armoire or a nightstand or a buffet or server, but there is no reason that you can’t use it for a very different purpose. Lifestyles have changed over a century, so our home decor and storage needs have changed too. But our love for beautifully made and hand-carved furniture doesn’t change! So one of my favorite tips for incorporating stunning antique furniture into your home is to think creatively! 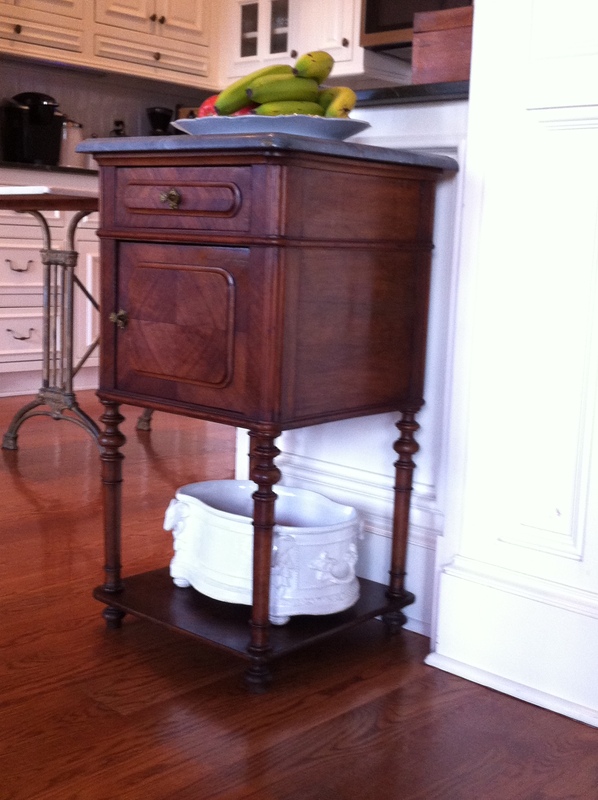 Here are some examples from our customers, starting with this terrific French antique nightstand that our customer Kathleen in Oklahoma used as a kitchen side table. The nightstand in the Henry II style dates to 1900 and the walnut marquetry and turned legs are nicely set off by the gray marble top. 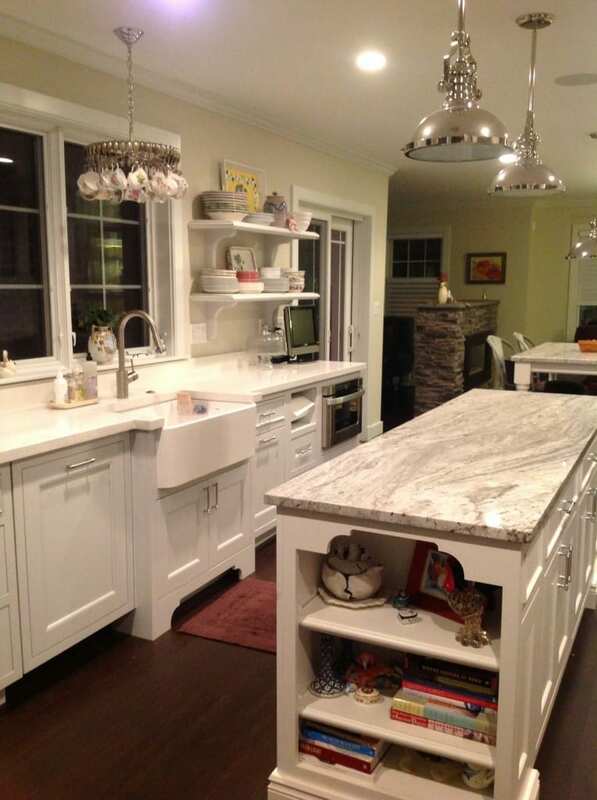 It gives Kathleen extra storage space in the drawer and cabinet and display space on the marble top and the lower shelf. 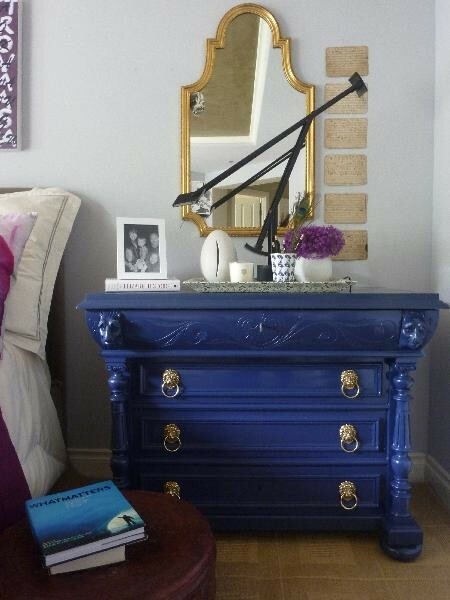 Read more about this Creative New Use for Antique Nightstand in my previous blog post. Sarah in Seattle also saw the potential in an antique nightstand. She turned this fabulous antique French Renaissance Hunting style nightstand into a side table in her living room. Sarah said “We love it!” We agree! 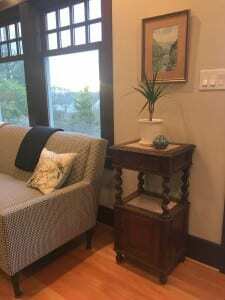 An antique nightstand makes a wonderful end table, side table, accent table or plant stand. The cupboard and the drawer offer storage for small items and the two levels are perfect for extra display or storage. The decorative appeal of the carved nightstand with its twist posts and marble tops is hard to beat! See more photos of Sarah’s living room with the repurposed antique French nightstand. Erin wanted a pretty antique bed for her new home in Colorado, but she also wanted a queen size bed and the one she liked on our EuroLuxHome.com antiques online store was a full size bed. It is typical for antique beds to be smaller in size than our beds are today, but we can often convert the bed frame to a larger size. That’s exactly what we did for Erin! This is the final result. 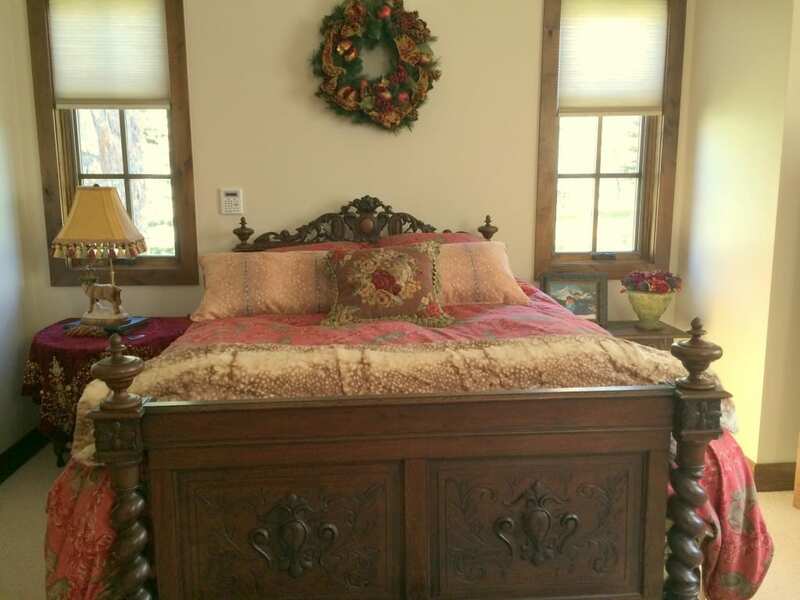 The antique French Hunting style bed that Erin chose is converted to a queen size bed. 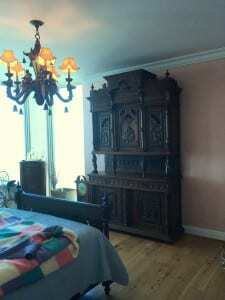 It dates to about 1900 and it is opulently carved in beautifully aged wood. 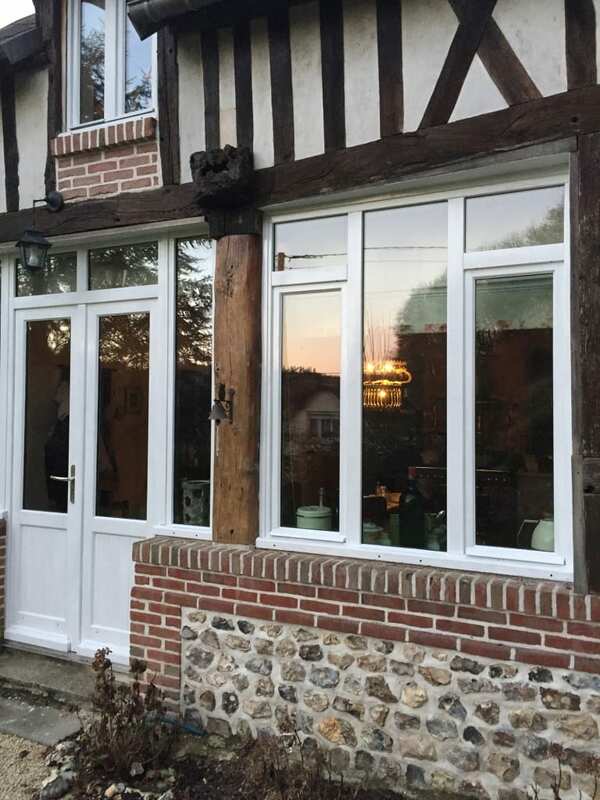 See more photos of the converted antique French Hunting Bed in my earlier blog post. 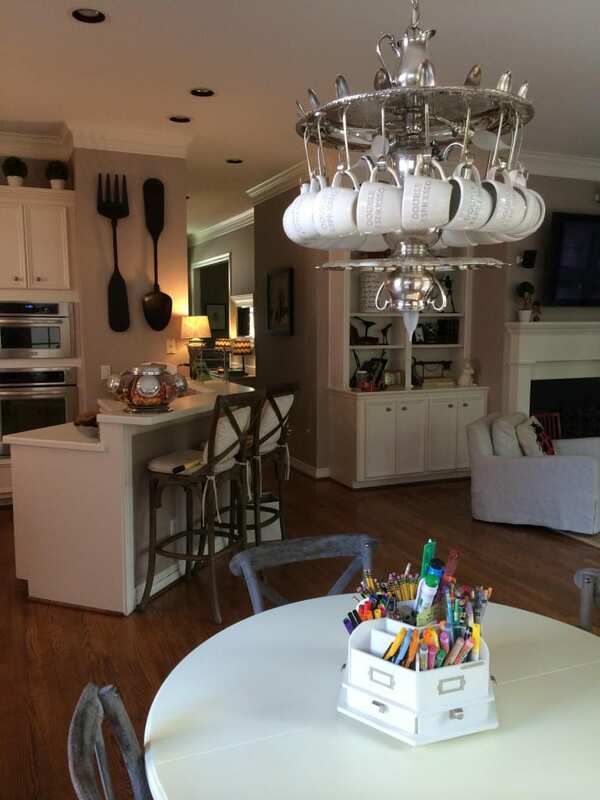 Our customer May in Florida ordered a French antique Brittany buffet and an antique Brittany bed from us for her delightful 14th floor Pensacola home. May contacted me to ask if we could have the Brittany buffet altered to accommodate a TV for viewing in her bedroom. We were delighted to oblige! See the full blog post showing May’s bedroom suite and how we repurposed the antique French Brittany buffet into a useful TV cabinet for May. Our customers Paul and Lane in South Carolina bought this gorgeous antique French Provincial armoire from us to repurpose into a unique gun cabinet. They were looking for a nice piece of antique furniture that they could use to store Paul’s gun collection. Lane liked the decorative carving on the 1890 Normandy style armoire. She also liked the mirrored doors that would hide the gun collection while giving her a wonderful full-length mirror in the master bedroom. 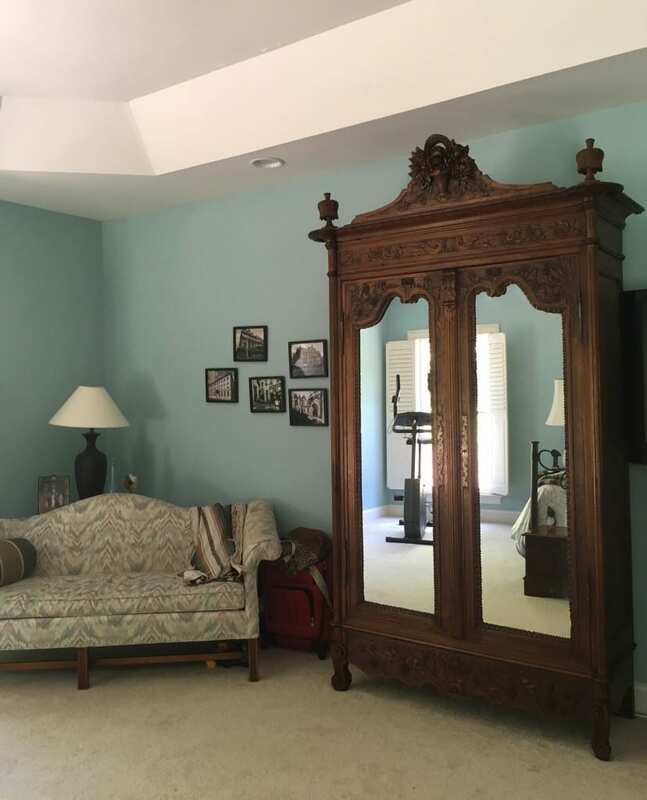 Read more about the repurposed antique French armoire. If you have repurposed a piece of antique furniture, we would love to hear about it! Tell us in the comments box below. 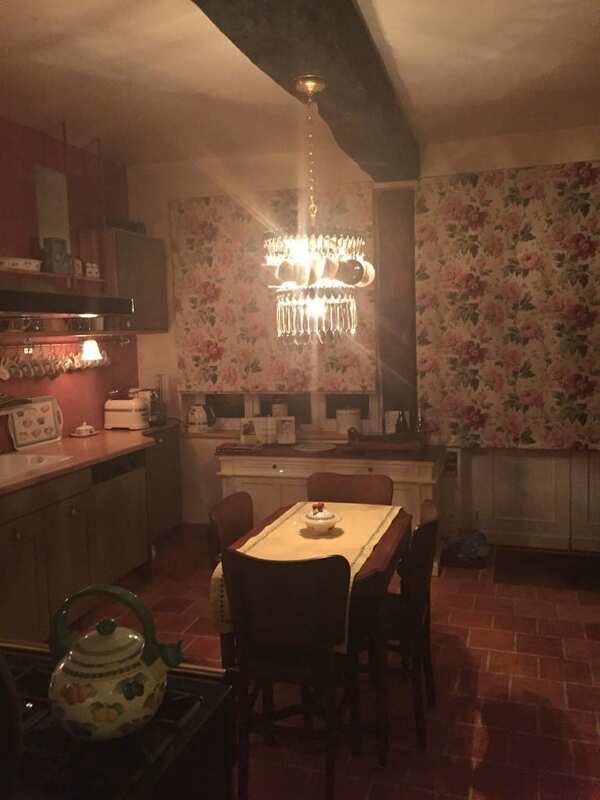 This entry was posted in Antique Furniture, Home Design Ideas and tagged creative home decorating, living with antiques, repurpose, Repurpose Antique Furniture, Repurpose Antiques, repurposing on January 23, 2018 by admin. Follow the honey! A new restaurant called Tupelo Honey Cafe opened last month in Greenville, SC, and we helped them out with an unusual addition to their interior decor: an upcycled chandelier! Tupelo Honey Cafe started out in Asheville, NC, and it has a couple of locations in Tennessee, but the Downtown Greenville restaurant is the first South Carolina location. The restaurant already has some awesome reviews for their food on Yelp, but we haven’t eaten there – yet! The menu offers a fresh twist on Southern food, or as they say: “Fluent Flavor Spoken Here.” Sounds like the perfect date night for me and Greg. 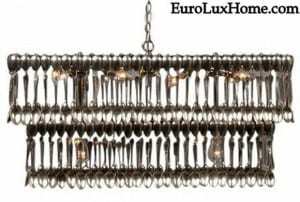 The upcycled chandeliers at EuroLuxAntiques.com are part of the whole upcycling trend and are custom-made by an artist for us. Upcycling just means taking something old and repurposing it into a new and beautiful object. Each item carries its vintage history into its newly crafted incarnation and, of course, each piece is unique. Here are some of the other wonderful upcycled chandeliers we have in the gallery. They are all hand-crafted by a very talented artist and can be custom-designed to order. This is a custom art spoondelier. 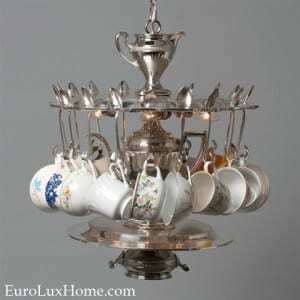 It’s crafted from 360 vintage silverplate spoons into four tiers in the same style as a classic crystal chandelier. 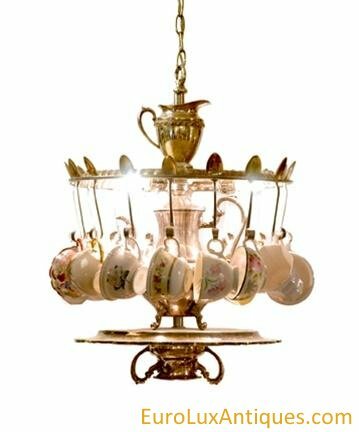 It’s a great whimsical touch for a dining room or kitchen, and a sweet addition to shabby vintage decor. It’s large too. At 40 inches high you can’t miss it and the artisan chandelier will certainly break the ice on conversation at a dinner party. 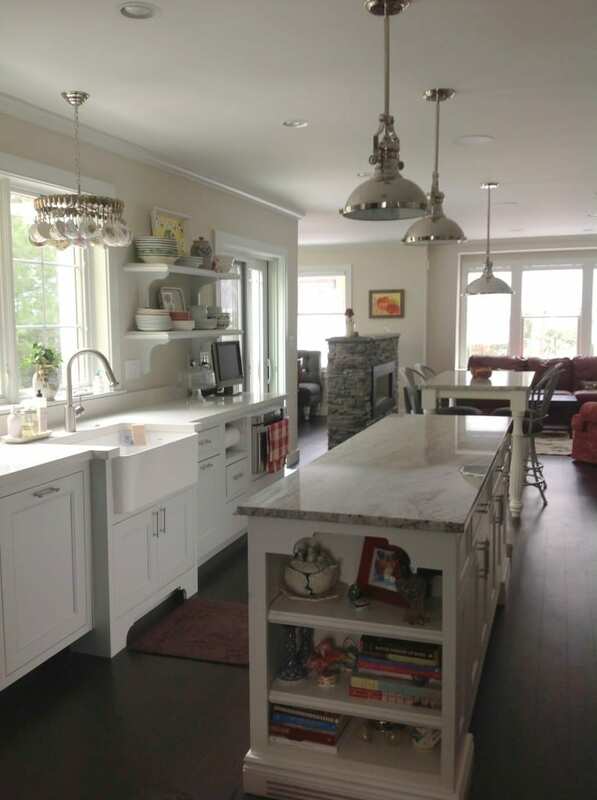 I definitely want a spoondelier for our vintage 1920s bungalow, whenever we finally finish renovations! 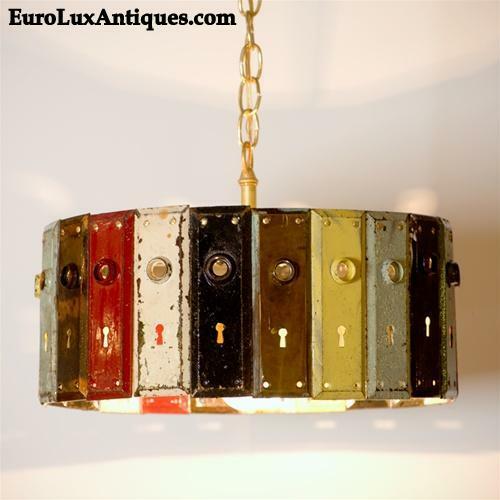 Or does this colorful pendant lamp have the key to my heart? 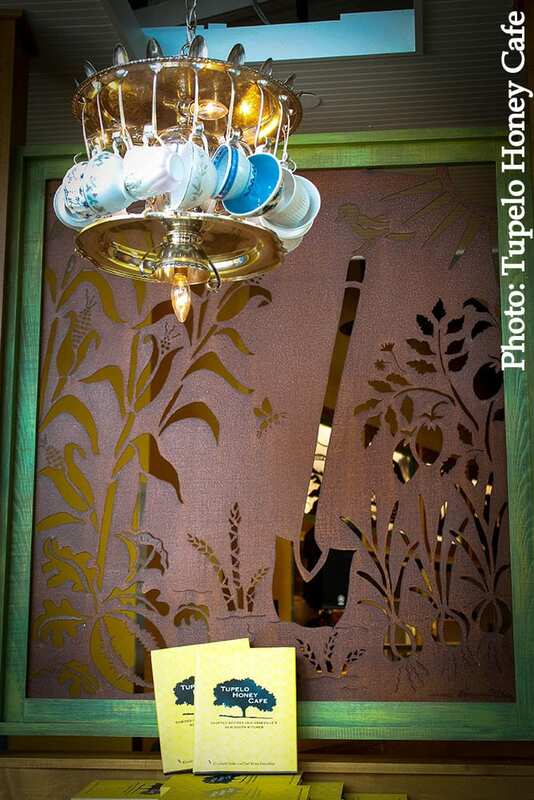 Look closely and you’ll see it’s made of vintage door plates, complete with keyholes and brass hardware. Once upon a time door plates like these would be consigned to landfill. Thanks to the creativity and vision of the artist they get a new lease on life. I can’t help but wonder about the doors these plates originally came from. It opens the door on my imagination! Can you guess what this bar-style light fixture is made from? I had to think twice when I first saw it. It’s made from 9 vintage electrical insulators… proving that just about anything can be upcycled deliciously if the artist is clever enough! 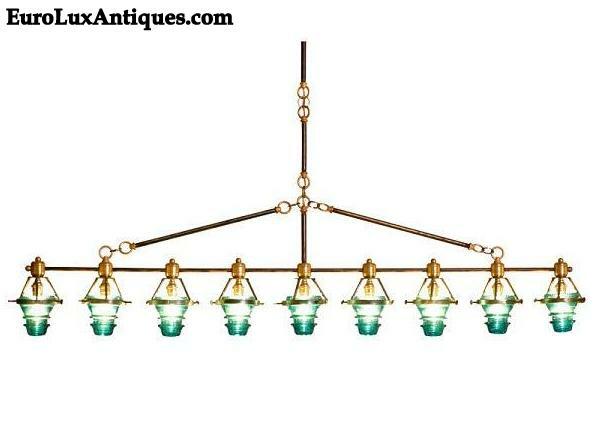 It’s 5 feet long and designed to cast a subtle light over a dining table, bar or even a pool table. This one is shown in Morse blue, but a clear insulator option is also available. 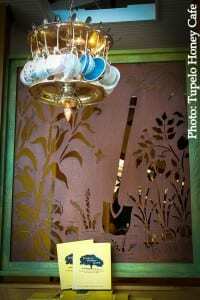 Thanks to our client Tupelo Honey Cafe for inspiring this post… if their food is as good as their taste in decor, we’re bound to become loyal customers! 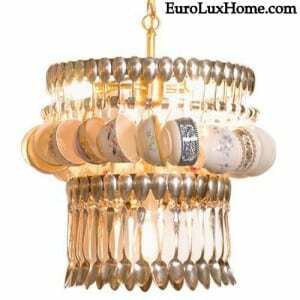 What everyday items would you like to see used to create an upcycled chandelier? 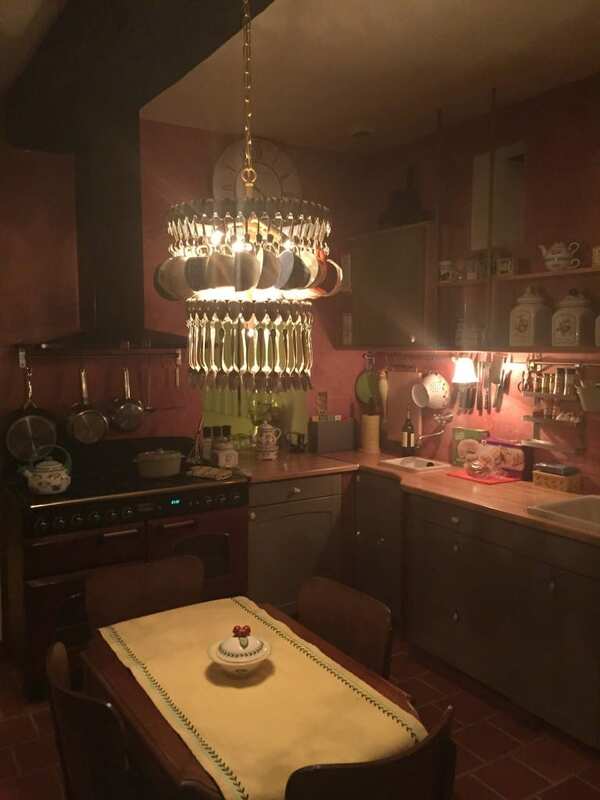 This entry was posted in Client Spotlight, Vintage Lighting & Chandeliers and tagged lighting, repurpose, repurposing, spoondelier, upcycle, upcycled, Vintage Lighting on July 12, 2013 by admin. 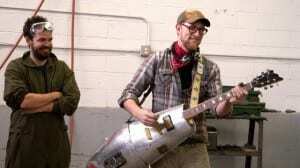 The hot new buzzword in antiques and vintage is “upcycling.” What does it mean, exactly? An “upcycled” object is something old that has been re-purposed into something new and functional. An upcycled object can be as simple as an old jar turned into an oil lamp, or it can be as complex as an antique sideboard turned into a dual vanity for the bathroom. 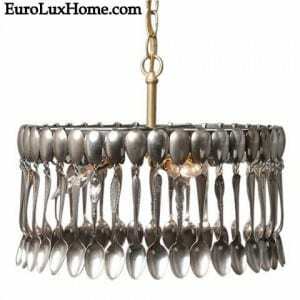 This “spoondelier” re-purposes 360 vintage silverplate spoons into a unique chandelier. 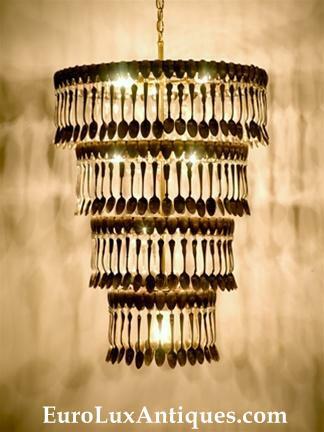 Those spoons might otherwise have wound up in a landfill. 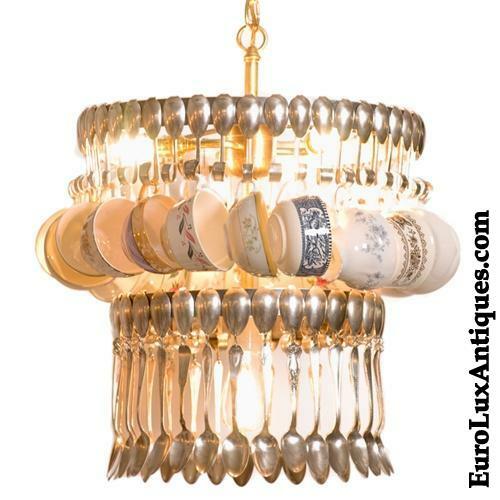 The spoondelier may not be for everyone, but for those who enjoy their antiques with a touch of whimsy, this is a great piece. Not to mention it’s a one-of-a-kind work of art, since each one is handmade and no two are alike. 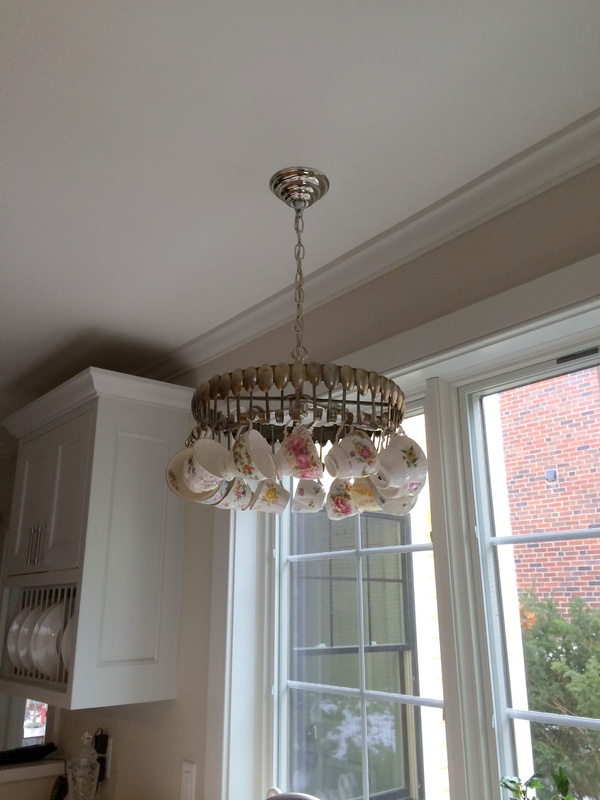 Blue insulators take on new life in this fun and beautiful chandelier! 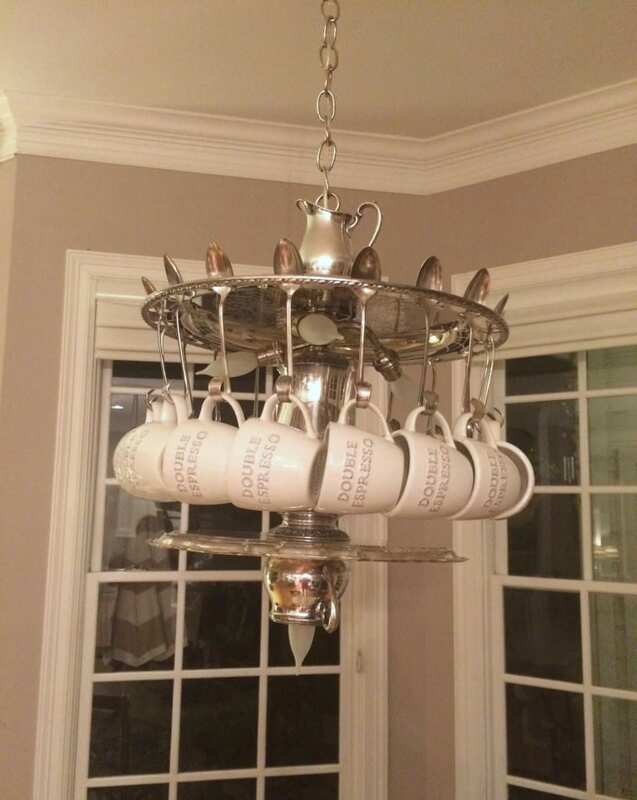 This delightful chandelier is a perfectly amusing piece for any cottage decor or for anyone who takes her tea with a lump of humor. OK, upcycling small objects is one thing, but would you ever consider cutting holes in an antique server? Some designers would! 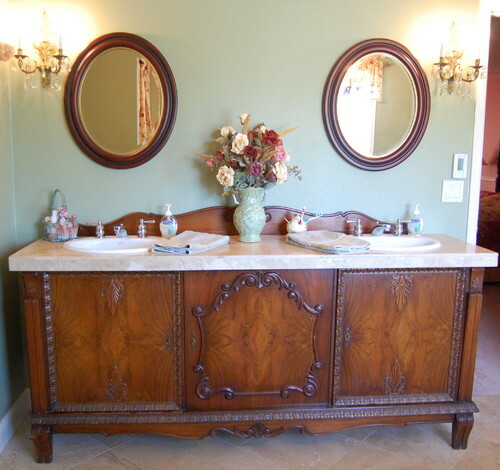 Above, interior designer Julie Murray found an antique sideboard to create a two-sink vanity for her bathroom. And another example. This old dresser not only got its top ripped off, but it got a paint job, as well! This upcycler did note that this particular dresser was “of no good quality.” Perhaps to ease her conscience? I take a positive stance on upcycling. If a piece of antique furniture can’t be saved any other way, why not paint it and put a sink in it? 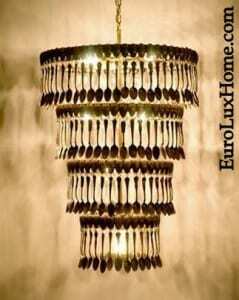 And certainly re-purposing old insulators and silverplate spoons into fun light fixtures can’t be a bad thing. But would I ever deliberately cut holes in a fine antique French wardrobe to run cords and cables through the back? Yes, I have done it. But I saved the small hole I cut so that it could be glued back in the future. 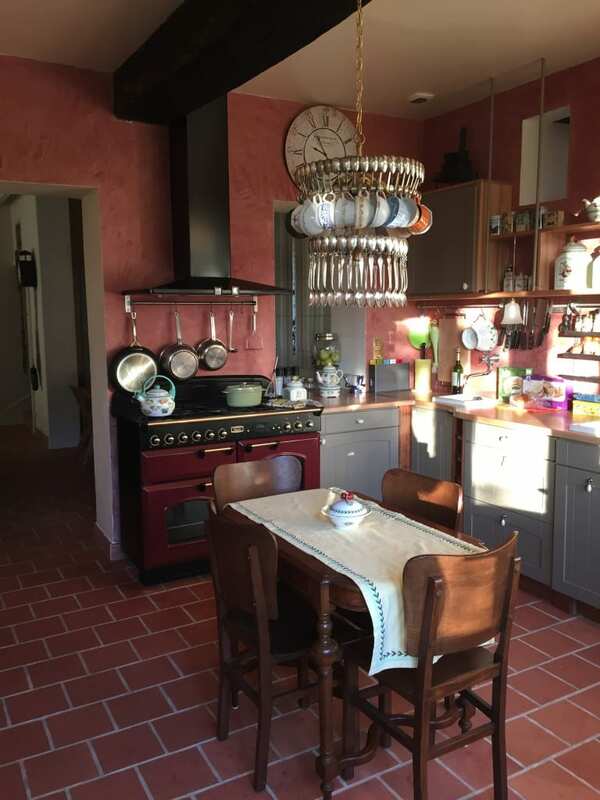 Living with antiques, I believe, means you should cherish and care for your vintage and antique pieces, but also make them useful and functional for your life today. What’s your take on upcycling? Where are your boundaries, in terms of re-purposing antique and vintage furniture and objects? This entry was posted in Antique Furniture, Home Design Ideas, Restoration Tips & Tricks, Vintage Lighting & Chandeliers and tagged antique sideboard vanity, Houzz, re-purpose, re-purposing, repurpose, repurposing, Robbie Cook, spoondelier, upcycle, upcycled, upcycling on December 18, 2012 by euroluxantiques.